Footprint Digital’s 2017 Christmas Newsletter! 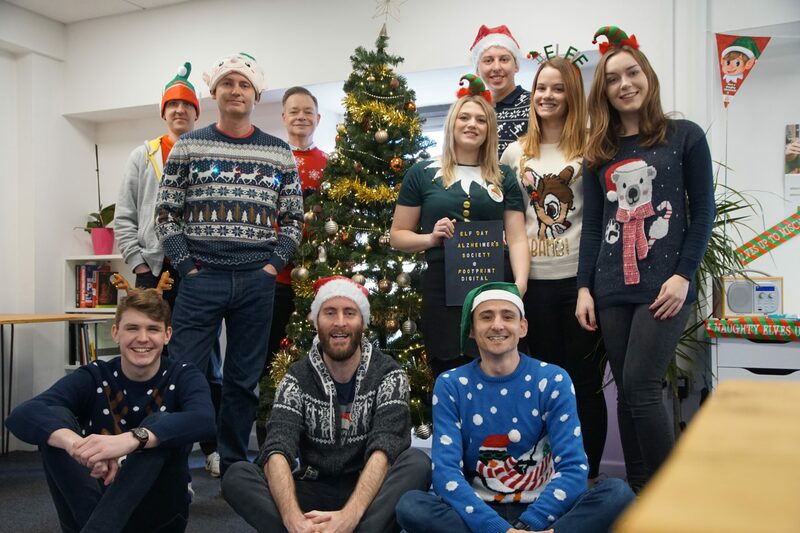 It feels like it was only yesterday that we were heading back to work in January, ready to take on the (digital marketing) world! In the last twelve months, we’ve had an office move, staff changes, exciting promotions, Google algorithm updates, new product creations, guest lectures, training days, an academy, and lots and lots of cake. What’s an office without cake? We’ve also had the pleasure to work with some absolutely fantastic clients, we are so lucky to work with the people that we do, and we wish you all the best in the new year! Have a read below to find out what we’ve managed to fit into an extremely hectic year! 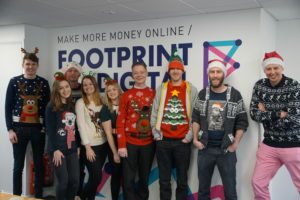 “A large portion of the Footprint team awoke early last weekend to run around a frozen obstacle course dressed as Santa to raise money for charity. It was a lovely moment and just one of many that I have experienced with this team this year. To work alongside talented, hardworking, conscientious and fun people is one of the great privileges in business. I had always known that our company would have the choice over the qualities in our team and partners, but, it has been a happy surprise that we would find these qualities in our clients, too! I admire the zest and verve of the businesses we work with. People that also share our values, our optimism and work ethic. With all of the doom and gloom plastered over the news I’m pleased to have you all as a far more positive reference point! 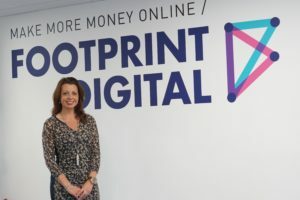 This year has been a busy one for Footprint Digital. Our friend, Bouchra Baibanou, is a constant reminder that there is nothing you can’t achieve, and we were incredibly proud to support her successful summit of Everest earlier this year! 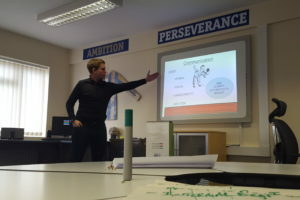 We have delivered many training sessions on behalf of our friends at the Department of International Trade and our busy schedule of lectures at The University of Essex has put us in touch with the future business leaders of the world. We’ve also welcomed a range of fascinating speakers through our ‘Think with Footprint’ series of talks. 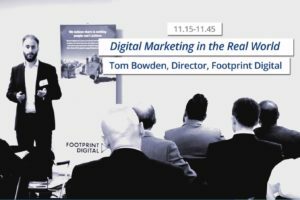 However, it is through our Footprint Academy 25-day Digital Marketing Executive course that I have had the greatest opportunity to get a feel for what the brightest and finest feel for the future. I for one am positive about the future- we are in safe hands! Our outlook for 2018 is laced with all of these positive influences and I look forward to striding into the new year with confidence. We are on the digital journey with both our clients and our partners, and will do everything we can to get you the results that take you to where you want to go next year. I am also pleased to announce that we will also be running a monthly ‘Digital Drop In’ education event for our clients to help continuously develop your knowledge of Digital. We believe that there is nothing you can’t achieve and exist to help you make more money online. Let’s make your 2018 a special one! I wish you all a lovely Christmas break and look forward to working with you in 2018″. 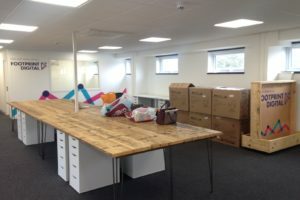 One of the best moments for Footprint Digital this year, was moving into our very own office! After a long time decking the space out, building chairs, filling the car boot with a jungle of office plants, re-enacting an episode of supermarket-sweep at The Range, and waiting (not-so-patiently) for the internet to arrive, we were finally able to move in in April 2017. The office has given us the space to grow as a team, be more creative, and feel a fresh sense of inspiration to do bigger and better things for our clients! It’s also got fantastic views of Jumbo on one side, and Colchester High Street on the other – we couldn’t ask for more! Not only have we changed offices this year, we’ve also had a lot of team changes. We’ve sadly said goodbye to two team members, Tim & Lori, both of whom were absolutely fantastic members of the team – we wish them every success in their new endeavours! Their empty seats were filled by two Relationship Managers, Reuben and Thomas. After a couple of months in the job, they’re taking things in their stride and we can’t wait to see them flourish and do fabulous things for our clients in the New Year! 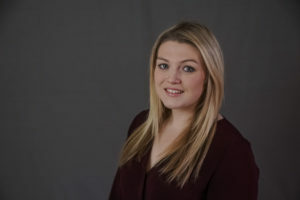 We’ve also had some very exciting internal changes, with Tom J taking on a partnership development role, Relationship Manager Caroline taking on the responsibility of streamlining our processes and product development, and Hannah moving into the role of Head of Client Services. 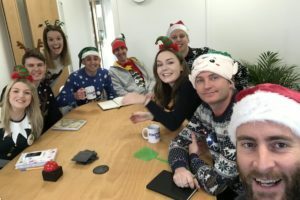 “Though we are all sat here puzzled about how it is December already, this time of the year is a great opportunity to sit back and reflect on what a fantastic year the Footprint Client Services team have had. 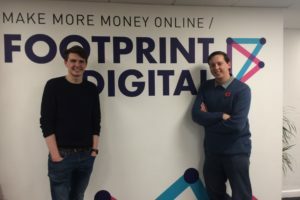 There have been lots of exciting changes to the department, including two new Relationship Managers, Thomas and Reuben, who have hit the ground running. Whilst most of our time is spent working, we do find the odd moment for a bit of frivolity here at Footprint Digital! 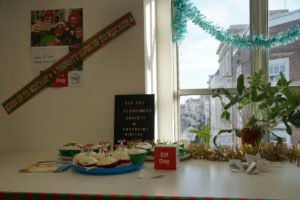 On 8th December 2017, the Footprint Digital team hosted an Elf Day, raising money for the fantastic charity, Alzheimer’s Society. 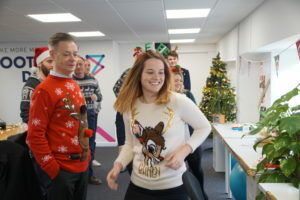 With the event’s organiser Hannah as Chief Elf, we dressed up, baked cakes, iced gingerbread and played games, really getting into the Christmas spirit for a great cause. We managed to raise £50 for the society, which we were very happy with! 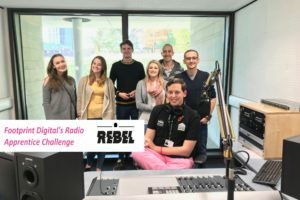 The Footprint Digital team love a bit of competition, and throughout the year we have been taking part in an Apprentice Challenge which has had the office split into two rival teams – the Sunbears and the Hungry Hungry Hippos. 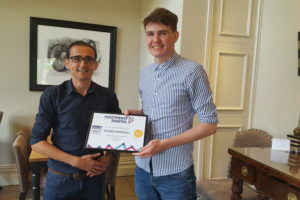 We also spent a very enjoyable afternoon at Maison Talbooth, celebrating the Graduation of our Footprint Academy Interns! We were incredibly proud of all of our interns this year, they took to the programme with gusto and really got involved in everything we asked of them. 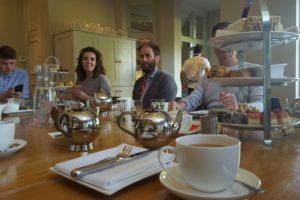 Learning so much in such a short space of time isn’t easy – so afterwards, we treated them to a delicious afternoon tea, and a game of bowls! 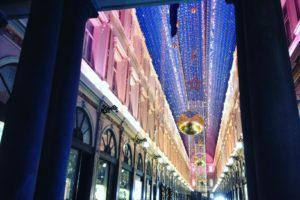 Partying in Brussels – and the Final Apprentice Challenge Score! This year’s Apprentice Challenge drew to a close at our Christmas Party on 13th December, which, true to style, Tom B kept a secret until the day. 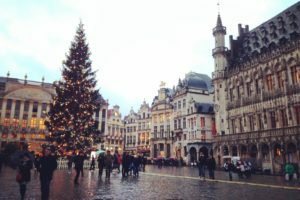 It was only a few days before we embarked on our final Apprentice Challenge that Tom announced it’s surprise location – Brussels Christmas Market! We split off into our teams, racing around shops trying to collect our list before the other team (and more cheaply). Reuben’s team, the Sunbears, already had a candy cane and an orange (you never know when these things will come in handy) but the Hungry Hungry Hippos clawed back the advantage by finding a Lidl to buy most of their list from (0.89 cent brie anyone?). 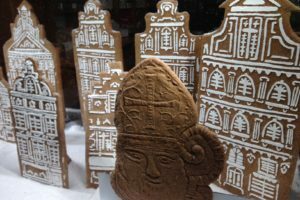 The gingerbread item was nowhere to be found, and no amount of sweet-shops were procuring a candy cane. Thankfully it all came together in the last few minutes, and both teams miraculously completed their lists! Shockingly, the coal was found first. Over lunch, Tom B counted up the costs, and found that the Hungry Hungry Hippos had spent drastically less (until Reuben found some extra Sunbear money in his pocket – but the Hippos were still cheaper, thanks to Lidl!) Unfortunately for the Hippos, they had been a few minutes late, and the penalty was so drastic that the Sunbears reigned victorious! Well done Sunbears – our Relationship Managers are always on time! 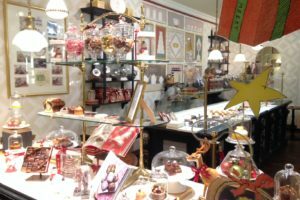 After the challenge, we explored Brussels (with a focus on the chocolate shops). It was a wonderful day, and a great opportunity to let our hair down and celebrate all of the hard work that we have done this year! At the very end of 2016, we began an education initiative called Think with Footprint. We see education as core to everything that we do, and throughout the year we have been treated to a series of talks by experts in different fields. It’s safe to say, it’s been a resounding success! We want to say a special thank you to: Dr Erik Jacobi, from the University of Essex (our first speaker! ); Corin Haines at Colchester United; Lori Cantwell; Carol Sawo (who taught us how to say no); Louise Fortunato (an expert in Mindfulness); Dr Maged Ali from Essex Business School; David, Co-Founder of Visii; Performance Coach Liz Flavell; Bruce from Mackman; and Tom Bool from Integro Languages. We’ve loved welcoming these incredible speakers into our office, and we can’t wait to see what Think with Footprint teaches us in 2018! 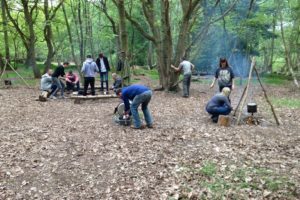 Fabulous Events for the Footprint Team in 2017! What a jam-packed year of events we’ve had! 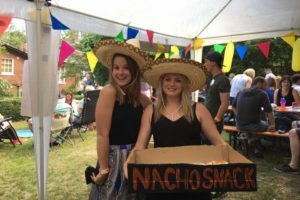 We’ve absolutely loved getting involved in external events, many of which took place at the University of Essex. We have a great relationship with the university (many of us having studied there) and we love to give back when we can. We have taken guest lectures, invited a student, Simran, to join us for a week in an Insight Experience, and had 6 students join us for our annual Footprint Academy. We are also lucky enough to take part in Department of International Trade Events, with our latest event taking place in December, at Weston Homes Community Stadium, home to Colchester United. These events are so much fun, and are a fantastic way for us to spread the message of SEO, and teach lots of SMEs new ways to improve their digital marketing efforts. It’s also great, because we get to test our quizzes out on a new room of unsuspecting people! In November, Relationship Managers, Hannah and Caroline, joined the charity Lepra at their Beyond Brexit event in Canary Wharf to deliver a presentation on the relationship between Brexit & digital marketing. 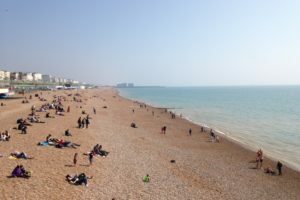 Other events have included NetXtra’s Breakfast club, and Brighton SEO in April & September (we’ve already nabbed ourselves tickets for next April!) Thank you all of those people who invited us to speak, and those that turned up to listen! If this year is anything to go by, then we know one thing for sure – if we blink, we’ll miss 2018! Have a fantastic Christmas and a very happy and healthy New Year! We’ll see you in 2018!